When it comes to Einstein teammates Nick Simpson and Ben Withbroe, it can be difficult to tell when they are working together and when they are racing one another. More often than not, they end up reaching the finish line at about the same time either way. Make no mistake: Withbroe's split-second victory in 16:45 at this year's MCPS Consortia Championships was the fair outcome of a complete effort by both athletes. "These boys weren't playing around today," said Einstein Coach Eric DaSilva. 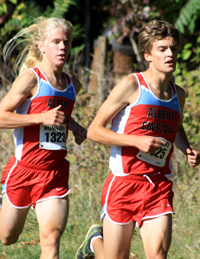 The previous Northwood course record of 17:30 was topped by 7 boys in the race including four from Einstein. The cold, sunny weather in the mid 40's was a contributing factor. Withbroe said that the race was exhausting but he felt that he performed better due to the cold weather. There was one additional factor that Withbroe believed worked in his favor. "[Simpson] is better at downhills. I am better at uphills," Withbroe said. As is usually the case at Northwood, the breaking point of today's race can be traced to the major uphill just beyond the two mile mark. Withbroe said that Einstein's top five runners were still pretty closely packed at the base of the hill, but the sting of that hill caused the pack to spread thin. When the runners returned to the Northwood campus, the Einstein pair had a comfortable lead on the field. With less than a quarter mile to go, there is a sharp downhill followed immediately by a sharp uphill. Withbroe and Simpson remained inseparable, but as they entered the track and initiated their 250 meter kicks, Withbroe gained a slight edge. Simpson pulled even once or twice, but Withbroe edged out his teammate as the PA announcer declared that both athletes shattered the previous course record. Einstein won the Consortia Cup with 24 points despite one of its top runners, Ryan Merrell, taking a nasty spill. Coach Eric DaSilva asked his boys to use today's results to believe that they can continue their success through the remainder of the season. On his individual victory, Withbroe had a unique perspective. "I thought it was my last chance to win anything," he said, acknowledging that he usually falls behind Simpson. "I was kind of a head case for a lot of races...Now I know I can do it." 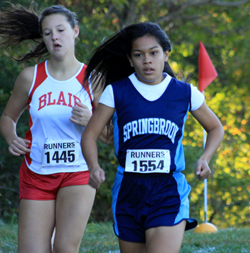 Unlike the boys, Springbrook's Sydney Almeida did not wait for the two mile hill to break the girls race wide open. She began to pull away from the field before the one mile mark. She extended her lead throughout the race to ultimately win by twenty seconds in 20:26. Almeida, who dropped nearly two minutes from her Bull Run Invitational time from 2011 to 2012, had a similar 1:45 improvement from the 2011 to the 2012 Consortia Championships. Another similar improvement at this year's county championship would put her under 19:00. She attributes her improvement primarily to sprint-triathlon training. She did different workouts every day over the summer. Sometimes it was track work. Sometimes it was long runs or hills. Of course she mixed in biking and swimming regularly, which also helped, but running, she says, is her strength between the three sports. "She may be the most focused runner I've ever had the pleasure of working with," said longtime Springbrook Coach Gary Frace. The Montgomery Blair girls won their fourth consecutive Consortia Cup in the tightest team battle in the meet's four year history. Einstein gave Blair a scare by taking the second and third positions behind Almeida, but Blair took four out of the next five positions. Despite losing a top three runner mid-race, Blair kept Einstein out of the reach of the Consortia Cup and claimed a two point victory by putting its #5 and 6 runners in front of Einstein's #5. Whatever happened to the other two Springbrook girls who were also very talented athletes? The ones from last year, Mayah Wallek and Dede motel? You forgot to mention all of the spirited cheering that the high school students were doing for the little ones! What about the Elem and middle school photos? They are the future HS runners. Proud of my son Sean Sarvi for winning the Middle School boys race for the second year in a row. Look out next year! !